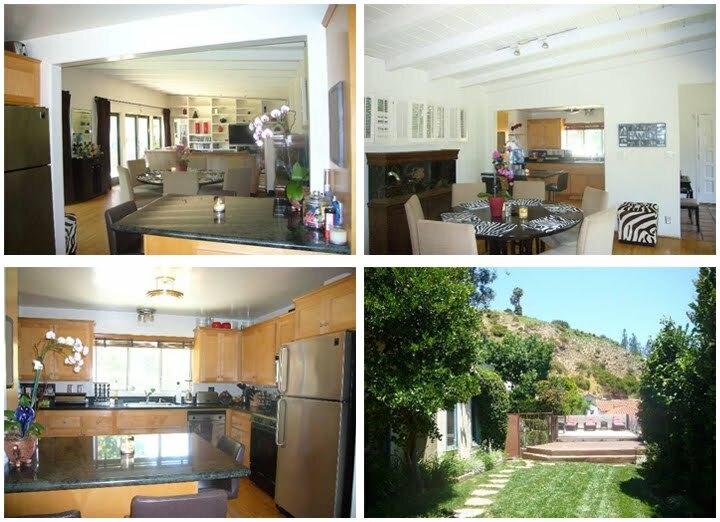 YOUR MAMAS NOTES: Back in late 2008 late-night talk show host and comedian Jimmy Kimmel scooped up a newly constructed and very contemporary crib up in the swanky star-studded hills behind the iconic Chateau Marmont Hotel on the Sunset Strip. The Jay Leno mocking Mister Kimmel paid, according to property records, $6,000,000 for his crisp and clean-lined wood and glass residence that measures 5,500 square feet includes 4 bedrooms and 4.5 bathrooms in the main house. A separate structure offers an office area, home theater and guest or staff quarters with private facilities. Property records now show that in January of 2011 the same real estate trust associated with Mister Kimmel's kontempo-krib up behind the Chateau Marmont snatched up the property immediately next door paying $1,100,000 for the 1,962 square foot single-story dwelling that includes 3 bedrooms and 3 bathrooms. Don't Your Mama know a damn thing about nuthin', of course, so what Mister Kimmel plans to do with the property is a real mystery. Mister Kimmel's nearby neighbors include celebs like John Krasinski and Cameron Diaz. Emmy winning screenwriter Ryan Murphy (Glee, Nip/Tuck, Running With Scissors) still owns (and badly wants to sell) a Carl Maston-designed mid-century modern-style house just up the hill from Mister Kimmel but presumably the budding tee-vee tycoon has already moved or will soon move to the Ralph Flewelling-designed hacienda in the flats of Beverly Hills that he bought in September 2010 for $10,o00,000 from actress and house flipper Diane Keaton. Miz Keaton, we heard recently from real estate yenta Kenny Kissintell, has set up temporary house in fish-lipped actress Meg Ryan's stunning Spanish style mansion in Bel Air that happens to sit right next door to the Richard Neutra-designed digs of smoldering fashion guru turned filmmaker Tom Ford. Anyhoo, records indicate that Mister Kimmel continues to own his previous home in the Hollywood Knolls neighborhood of Los Angeles that he bought in May of 2002 for $925,000 as well as a house in the seaside enclave of Hermosa Beach, CA located a short block-and-a-half from the beach and that records indicate he bought in May of 2004 for $1,650,000. I think what he'll do is tear it down. An obvious teardown, although Redfin shows it as selling for $1.1MM on 10/18; strange, the real estate ways of these odd creatures we call celebrities. I loves me a multiple parcel compound! As Mama says, if I had the dough-rey-me I would do the same. Even the obligatory orchids cannot rescue this place from mehness. I really love the phrase "obvious teardown", it is so beautifully dismissive.